BBC cameraman Ron Skean was "violently pushed and shoved" by one of President Donald Trump's supporters at a rally in El Paso, Texas, on Monday night. Footage from Skean's camera shows him thrown off balance, before recovering to film a man being led away and yelling "f--k the media." The BBC said it was "unacceptable for any of our staff to be attacked for doing their job" but said the president signalled to check that Skeans was OK after the attack. BBC journalists in Washington connected the attack to Trump's criticisms of the media on Monday and at other rallies, and said they had faced abuse at Trump's events. A BBC cameraman was attacked and pushed by one of President Donald Trump's supporter yelling "f--k the media" at the president's rally in favour of a border wall in El Paso, Texas, on Monday night. Ron Skeans was "violently pushed and shoved by a member of the crowd while covering a President Trump rally in Texas last night," a BBC spokesman told INSIDER in a statement. Skeans told the BBC that he was taken aback by a "very hard shove," at the rally adding: "I didn't know what was going on." Greg O'Donoghue, the BBC's Washington Correspondent, shared footage from Skeans's camera, which jerks away Trump to the floor as Skeans is pushed. The man tried to smash Skean's camera, O'Donoghue said. After ten seconds the camera stabilizes, pivoting to show a man wearing a red "Make America Great Again" hat repeatedly yelling "f--k the media" as he restrained by another man, who appears to be wearing an identical hat. Members of the crowd can then he heard yelling "get him out" as the man is escorted from the scene. The man was eventually removed by security, and Skeans is "fine," the BBC spokesman said. He added that Trump "could see the incident and checked with us that all was ok."
— Gary O'Donoghue (@BBCBlindGazza) 12 февраля 2019 г. 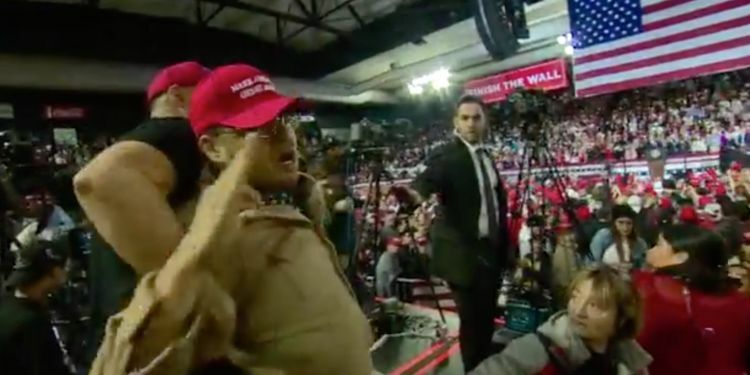 President Donald Trump's supporter yelling "f--k the media" at the president's rally in favour of a border wall in El Paso, Texas, on Monday night.